Minaj promises that her upcoming album is her best project yet. Nicki Minaj has shared her new songs "Barbie Tingz" and "Chun-Li." Listen to them both below. The Young Money artist's comeback songs were announced Tuesday on Instagram. It's her first solo music since 2014's The Pinkprint, and follows a string of successful featured verses on songs like Yo Gotti's "Rake It Up," "MotorSport" with Migos and Cardi B, and Lil Uzi Vert's "The Way Life Goes (Remix)." 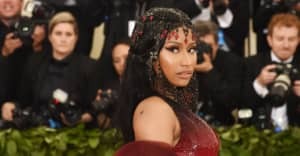 Last September, Minaj said that the new phase of her career would be "the most memorable and the most impactful of my career yet.” On Thursday, she told Zane Lowe on Beats 1 Radio her upcoming album is her best yet. Listen to "Barbie Tingz" and "Chun-Li" below.